I realize I haven't been around here much for the past two months, and I apologize for that. I have been working on Christmas commissions and my laptop has met with an early demise - permanently. This has put a serious crimp in being able to post and update bth my website and blog, but I'm working on rectifying that. 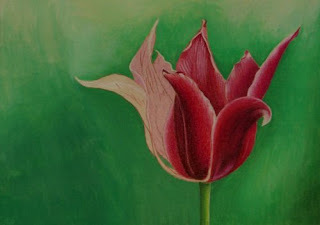 I have now completed the tulip I posted awhile back as a WIP and I am finishing up another flower, a Bird of Paradise. 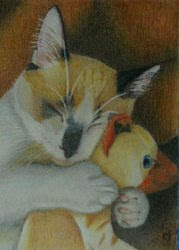 Those two will be put into a show in January, along with another tulip that I completed several months ago. In addition, I am starting on my next two inspirational paintings, Morning Devotions and Is Your Name In The Book? I will post those as they come along. Right now I want to wish everyone a very MERRY CHRISTMAS and a BLESSED NEW YEAR!!! In between working on my latest portrait commissions, I'm doing some smaller pieces. I'll be going to an art trade show in Raleigh, sponsored by Jerry's Artarama two weeks from now. I'll be taking one pastel workshop and doing lots of art shopping!! I was contacted by a rep who works for UART who make UART sanded paper in four different grits. He asked me to stop by his booth so we could talk about how well the paper works and any problems colored pencils artists may be having with the paper. So, in an effort to get ready for this conversation, I have decided to do something small on each grit of the paper. Here is one of my tests. This is on UART 500 grit paper with watercolor pencils for the background and Prismacolor colored pencils for the flower. Now, it's not nearly finished. 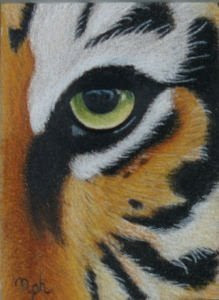 I need to go over the background again, and I'm trying to decide if I should do it with CPs, WCPs, or pastels. Obviously the flower is not done yet either. So far, I really like this grit. It has enough tooth to be able to hold many layers, plus being able to blend the colors with a brush over and over without running out of tooth. I don't like my sanded paper to be too smooth. To me it defeats the purpose of using sanded paper if it's too smooth. On the other hand, there is such a thing as too much tooth! I also tried a miniature piece on La Carte sanded paper and I didn't like it very much, for a variety of reasons, one of which is that it appears to be too rough for me - but that's for another post. In addition, I probably put about five layers of watercolor pencils and was liberal in my use of water, yet I still have lots of tooth yet to fill! The paper was easy to get flat again after all the water dried - I simply put the paper in a resealable plastic bag, then placed a very heavy, large book on top of it and left it for a day or so. Viola! The paper is flat once again! Guess I'd better get working on this and finish it so I have time to work on at least a few more. I believe this is completed! I have spent a few hours tweaking it and looking at it in greyscale, so I think it's okay. Just need to hear back from my client and get his okay before I begin spraying. This painting will get two layers of permanent fixative, then three layers of varnish before it is ready to be handed over to my client. It's better to do all of that spraying over the course of at least two days, so I need to begin it ASAP so he can get the portrait on time. 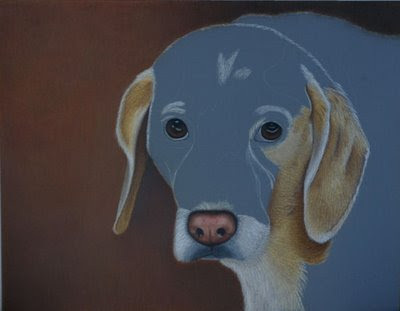 I am awaiting my client's approval so I can begin spraying. All right, I've almost got this portrait done! Spent all day working on this and bathing cats (yes, plural - three to be exact). I'm very happy with how much I got done! Lots of tweaking to do now. I see something with her left eye (as we see it) that needs to be fixed, and some areas above her left eye that also need to be tweaked, and several small areas that need the values fixed a bit. I'll sit and look at it for a day to see what I else I need to tweak, then I'll have to spend at least one whole day spraying. This painting will get two layers of permanent fixative, then three layers of varnish before it is ready to be handed over to my client. It's better to do all of that spraying over the course of at least two days, which means I have to finish tweaking tomorrow so I can start spraying. I hate to be rushed like that because whenever I am, I always find something glaringly wrong later on that screams to be changed but I won't be able to do anything about it. However, my client really wants it for his wife's birthday, and I really want him to have it on time. Since we are going away to Seattle for the CPSA Annual Convention from July 27th - August 3rd, I need to have this done before we go. I have started her body now, but still needs a lot of work. The first 4 layers are layed down, but still need to get more depth to her body. It's looking a bit flat at the moment. Still hoping to get it done before our trip! 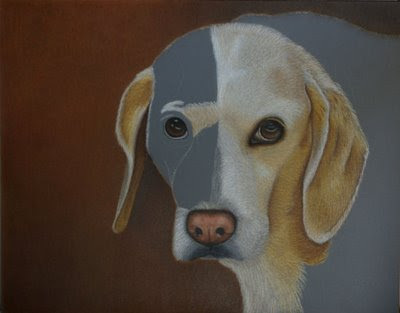 I have done half of Goldie's face now and checked the values. I have to be careful though because Goldie's face is mostly white, with a few other colors mixed in. The values are simply to model her sweet face, not to add color. Now I'm actually starting on her shoulder. Just a quick update. I'm mostly working on the values on her neck, chest, and ear. Ignore the part under her right eye (as we see it). I have only just begun to work on that. I'm mostly working on the shadows right now while I try to figure out how I want to do her face. Still hoping to have it done by July 25th! I've started working on her face and ears now. None of this is finished yet. Got more adjusting to do with the values on the ears. The muzzle is only just started. Working on her neck and chest now too. I'm concentrating more on the values at the moment and will add more detail later toward the end. Got to fix the values on the right ear tonight. Tomorrow I have all day to work on this and to prepare for a horse show I'm judging on Saturday. Still hoping to have this completed by a week from Friday (July 25th). I have fixed Goldie's eyes now. Someone pointed out that they were a bit uneven in size, so I got out my ruler, checked my proportions and found out they were off just a bit. The size and proportions are now correct, but I need to tweak the right eye's coloring now. I have the background near finished, but it won't be completely finished until after Goldie is done. Now I can get started working on Goldie in earnest! 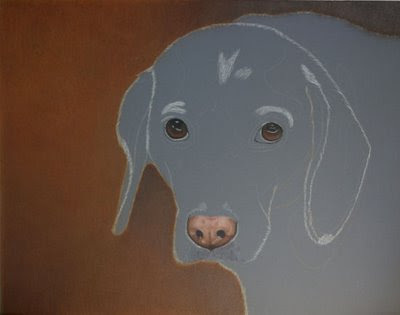 I'm trying like crazy to get this done before we leave for the CPSA convention in Seattle on July 27th, so I need to move fast and hope I don't have any problems along the way. The coloring in the photo below is slightly off, but not too much. I'm using quite a combination of colors on the background. 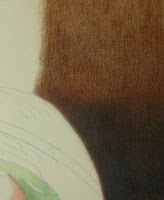 Let's see, Coloursoft brown earth and mid brown (LOVE those two colors), Derwent Studio brown ochre and golden brown, Prisma goldenrod, burnt ochre, dark brown, dark umber, and black, and Polychromos burnt ochre (which is quite different from Prisma burnt ochre). And of course I'm using my handy dandy trusty bristle brush to blend the colors in. The dark areas of the background definitely need to be darkened a bit more, but I'll get there. It's time to get Goldie going now! 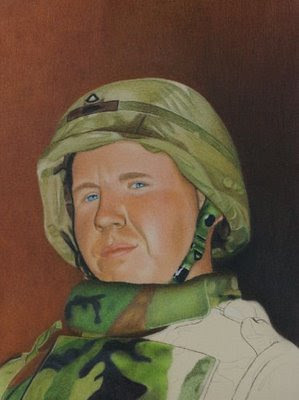 Fallen Soldier Portrait - Completed! All right, it's finished, finally! Whew! I knew I got the flak jacket right when my husband (with twenty years of military experience) looked at it and could recognize the different parts right away. I wish he had explained all of that to me BEFORE I started working on it, it would have made a lot more sense and been easier! The young man's mother has seen the painting and I got the ultimate praise - she immediately recognized her son and started crying, which of course started me crying. I REALLY must have got it right because I never had to make any changes to it. She said it looked like him and nothing needed to be changed. WOW!! Talk about making my day! It's all done and ready to be sprayed. I won't be making any changes to it, especially since the family is very happy with it, but all of your comments and critiques are welcome. I have two more to do after this as well, so the learning process is continuing, and C&C's will help on the next one. I just looked at it and thought some explanation was needed to clarify something. The young man's face was actually quite burned by the desert sun and since he had to wear goggles often, he was actually very pale all around his eyes. I didn't want to make his face quite like that, but I also didn't want it to be unrealistic. So I compromised. I made his skin around his eyes darker, but not completely equal to the rest of his face. That's why he has a kind of ring around his eyes. Details: Prismas, Coloursofts, one Lyra pencil, two Verithins, and a multitude of bristle and stencil brushes on sand colored Colourfix paper. Well, what a day I've had! 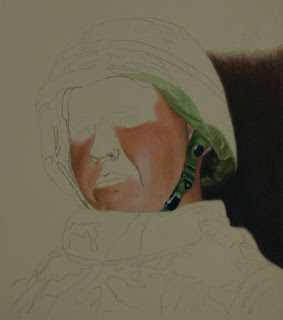 I got up at 8:30 AM, got my coffee, sat down at my drafting table, and spent the next seven hours (minus one hour for a lunch break) working on my soldier portrait. I am SO close to finishing it now. Only a couple of hours more, then the tweaking begins and it will be DONE! Yay!! Wow, I was beginning to think I'd never finish it. The weather was so cooperative today. Temp in the 80's and low humidity. I had to take advantage of the beautiful day and get a lot done because the heat and humidy are coming back again tomorrow. 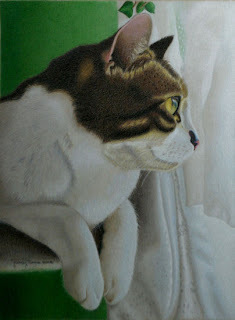 Once I finish this piece, everything else I'm working on is on Pastelbord, so I don't have to worry about the weather. Down the homestretch now. Almost done!! Couldn't sleep this morning so I got up. Since it was amazingly cool, I pulled this out to work to before it got hot & humid again. Worked for about 2 hours on it before it started heating up. I still need to tweak the colors of his uniform here and there, as well as his eyes, but I am getting soooo close to finishing this .... finally. His family has been waiting so patiently for this to be done! 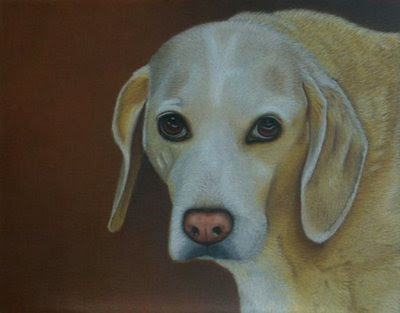 I have just received a new commission for a portrait of a dog. She's a real sweetheart too! Goldie is a 17 year old mixed breed dog and the love of my client's wife. My client wants this to give his wife for her birthday in August. I think that's sweet, but I'll have to work fast! 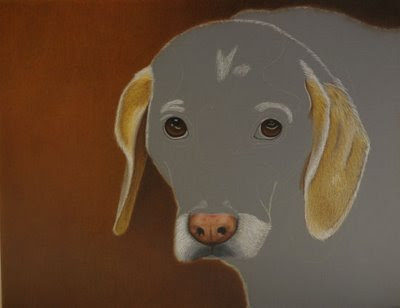 I'm going to be doing Goldie on gray Pastelbord, because I don't have to worry about heat & humidity with it. It's a sanded primer painted on a wooden surface, so it's pretty tough stuff. 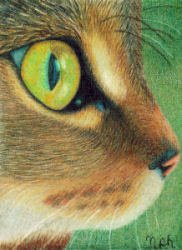 I first did a practice painting of a cat on a 5 x 7 piece of Pastelbord to practice techniques and such since I have never done an animal on this surface before. I don't want to mess up Goldie, so I wanted to make sure of everything before I got started. 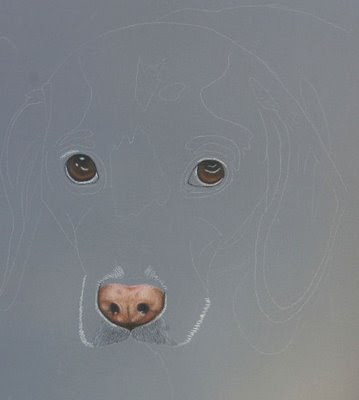 I have now sketched out Goldie and have just begun work on the portrait. So far, I have worked on her eyes and nose, but they are not finished yet. They won't be completely finished until the whole portrait is done. Goldies eyes are now very dark and have cateracts in them. When she was younger, she had more brown in them. I'm lightening her eyes a bit, adding some brown, and taking out the cateracts, but trying to not change them to such a point that they are unrealistic for her age. Her nose needs much more work. 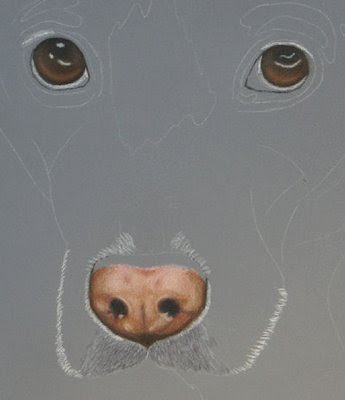 I always seem to have trouble with the colors in a dogs nose. Next I will start working more around her nose and eyes, bringing out the 3-D look in them. The first photo is the entire sketch but not including the background space. 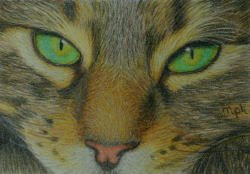 I have also included a close-up of her eyes and nose. Any C&C's are always welcome, especially at this stage! Didn't have to go to McDonald's today because the humidity dropped unexpectedly and I got a chance to spend a few hours on it before the humidity started coming back again. I now have about one third of his uniform done. Not too long to go now before I'm done!! I can truly see the light at the end of the tunnel! Unfortunately, this photo of the portrait looks a bit on the dark side. I'm currently using my husband's computer and I've found that his monitor tends to be on the dark side, so I really don't know if the colors are off or if it's his monitor. If the photo really is dark, I apologize. I have now started on his uniform. This part should go fairly fast since I have already worked out the palette. I just need the days when I can work on it. The weather's back to being humid, so it's back to McDonald's tomorrow. Also, the face is still unfinished and will be finished when the uniform is done. Hoping to have this done by the end of the month, first week of July at the latest. 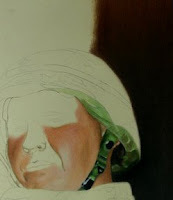 Then I have to start on another soldier portrait. I can see the light at the end of the tunnel on this at long last! 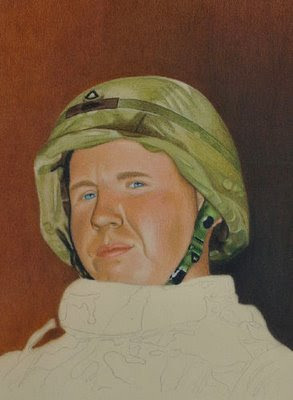 I have now finished the soldier's helmet, but there are still bit & pieces of his face that I am tweaking. His eyebrows mainly. Now I'm onto his uniform. That should go fairly quickly since I have already worked out the palette for it. However, it has turned humid once again here and we currently have a storm passing through, so I may have to go to McDonald's again to get more work done on this. This is now moving along nicely and I hope to have it completed by the end of this month. 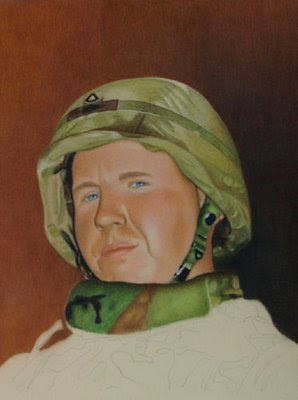 I have managed to get some more done on this portrait. I'm hoping to have this done by this weekend, at the latest by the end of the month. I still need to work on his eyebrows and I haven't put his eyelashes in yet, other than that and maybe a few other tweaks, his face is almost finished. I'm finishing the helmet right now, then onto his jacket. Of course, the background is completely finished except for some fine tuning around the edges of the soldier after I finish with him. Drawing day was almost a bust for me. We have had a heat wave here you would not believe! Five days of near 100 degree (or more) weather and humidity over 70%, and we don't have A.C.!!! So, not much art got done. I couldn't pull out any paper because it would immediately be ruined. Also, my laptop is going to be shipped back to HP for repair after I go to a photo shoot for a commission this morning, and will be gone for two weeks. I can use my husband's computer, but at the moment, I can't download anything from my digi. So, my updates will be limited for awhile. 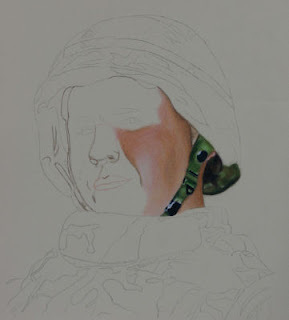 Hopefully, my soldier portrait will be done by the time my laptop gets back! 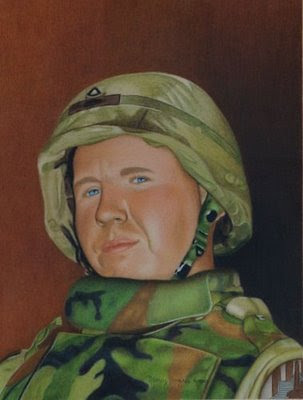 I have finally got the background finished on this portrait! Whew! Now, onto finishing the mouth and the eyebrows. Hopefully, we'll have a few more days of low humidity so I can work on this some more. Here's what I was doing while it was too humid to work on the soldier. I decided I wanted to do some more flowers, having been properly inspired by a wonderful pastel artist. 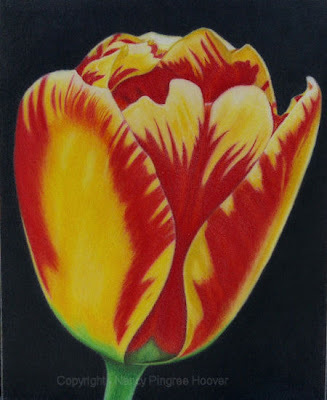 My rendition of a tulip is rather sad compared to her gorgeous paintings, but I tried! 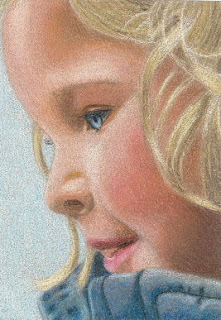 This is Prismacolors & Derwent Coloursoft colored pencils on white Pastelbord. It's 8 x 10 and it will be varnished as soon as I am confident that I do not need to do anymore on it; then it will be framed sans the glass. This is also part of a collection I have started to bring to a gallery in November. BTW, sorry about the copyright mark. An unfortunate necessity nowadays. I had to take a break from working on this piece due to humidity. I didn't want it to get ruined, so I put it aside, sealed up in plastic, until the humidity went down. I am determined to get this finished ASAP. Not only because I want this young soldier's parents to get it, but I need to get it done before the humidity sets in here for the summer. I have been blessed so far with cool fronts coming through (with the exception of a few days last week). Oh, and we had a daughter and her family come up from Texas to visit and to see my husband's ordination ceremony. So, I've had a very busy week, but everyone's gone now and I can concentrate on getting this finished. Remember as you look at this, nothing is finished yet. It's on sanded paper, so it looks rough in some areas, and the colors are not all smoothly blended yet. 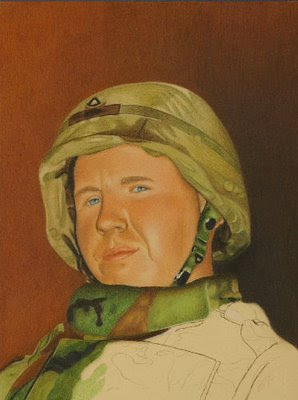 The young man's face will also lighten up as I put in the dark background too. I opted to make his forehead darker than in the photo, but not as dark as the rest of his face. I don't want it to be totally unrealistic. You'll notice I am leaving the eyes and mouth for last. 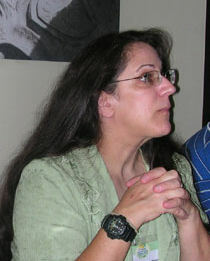 Usually I do these areas first, but in this case, these areas in the photo are not clear. They are a bit blurry, so it's hard to see the exact shapes and details. I hope I can get them right. 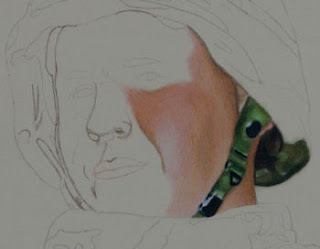 It was brought to my attention that I did not show, nor did I tell you what kind of pencils I am using on my soldier portrait. So, here is a photo of a couple of the pencils. 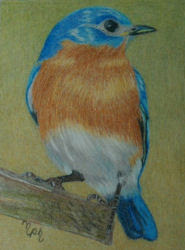 You can't tell from the photo very well, but I'm using Prismacolors and Derwent Coloursofts. I'm really only using the Coloursofts for the background (mixed with the prismas), and only the Prismas for the actual portrait part. I'm showing in the photo above, two of my favorite Coloursoft colors: Mid Brown and Brown Earth. The Coloursofts have wonderful browns!!!! I will be adding additional colors as I continue on with the background. I told you I would show you how I blend my colors on Colourfix paper, so here goes. I apologize for the color and lighting in the photos. It's a cloudy day and I didn't have much natural light when I took the photos. Okay, I'm working some more on the background. This first photo is after I added five light layers of various colors onto the colourfix surface. You can still see a lot of tooth. As a matter of fact, it doesn't look like I've added that much color at all, but five layers is enough to start the blending process. Just be sure not to start your blending with the brush too early. It won't work if you have only a couple of layers of color on the paper. Now, I've blended gently with a bristle brush. Actually, I got carried away and added a few more layers of color and then blended again, then I remembered that I forgot to take a photo as I went. So, I will do another section so you can see step by step how I do it. All right, I'm back at five light layers of color on a new section of the paper. Again, you can see how much tooth is visible. Now I blend the colors gently into the paper. If you aren't gently, you can use up the tooth faster, so be careful. Now, this stage looks pretty bad, but that's okay. Now, I add about five more layers of color on top of the blended area. I'm trying to get a smooth transition as well as slowly lighten the background making it gradient. Here are the colors added on top of the blended section before blending the second time. Usually, I trim the tip of the brush a little shorter than it is when I purchase it. This helps with the blending process, however, make sure you don't trim it too short! It will be harsher on the paper and will brush all of the color OFF of pastelbord and colourfix paper instead of blending it into the tooth. You'll have to trim loose hairs every now and then as well. Be sure to only use the brush on one color at a time. This is important because you don't want to mix colors! Look back at the color on this brush. 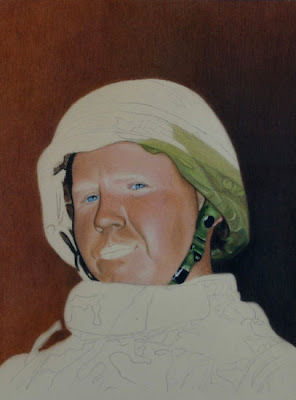 If I went and used the brush to blend the soldier's face, what do you think would happen to the color of his skin????? That's why I have MANY brushes of all sizes. I probably use five of them on each piece. One final note on the brushes: They are washable!!! Just wash them in your sink with regular soap, rinse them out real well, and dry them on a paper towel. Darker colors such as black or dark umber will stain the brush, but if you have thoroughly washed it with soap & water, you can use it on any color the next time, even skin tones. Okay, back to the painting. here is the painting after blending yet again, very gently, the additional layers of color. I can still add many more layers and blend more if necessary to smoothly blend the colors together so they transition gradually, not abruptly. And here is that entire section finished. I wish you could better see the colors as they very gradually transition to a lighter color. I guess you'll have to take my word for it until I can get a cooperative day with sufficient sunlight to take a good photo. If anyone has any questions about this lesson, please just ask and I will try to answer your questions as best as I can. 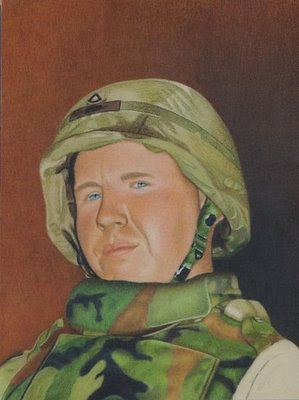 UPDATE: Here is an updated pic of this young man's portrait. His skin looks a little rough but it will be smooth out as I go along. Nothing is finished in this portrait at all yet! I'm still getting the basic layers down and starting the blending process. Also, this pic is a bit darker than it is in real life. I just noticed that. Sorry. Now, the decision I have to make is whether or not to remain true to the photo and make his forehead as light in color as it is in the photo. 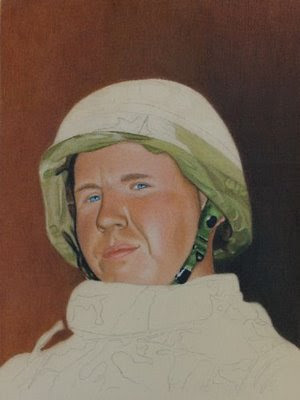 In reality, this young man's forehead is very light colored because it has not been exposed to the desert sun as the rest of his face has been. I would rather make it all evened out and not such a drastic change in color. However, his natural skin tone is, in actuality, quite light. So, I have a few things to think about and work out. I'm using my brush method to blend the colors and smooth out the painting. This method has worked wonderfully for my paintings on Art Spectrum Colourfix paper, but thus far it's been a bit harder to get as smooth a look on Pastelbord (I'll post examples of those at a later date). 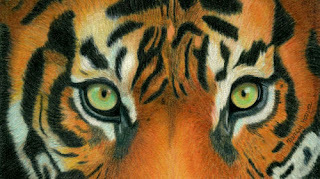 I'll see if I can get a close up soon of how I use the brush to blend the colors so you can see what I am talking about. It's a great technique that I love to use, but it must be used carefully so you don't fill up the tooth of the paper. IPWell, look at that. It's been almost a month since my last post! I've been in such an artistic slump for quite awhile now. But, finally, I got started on trying to finish up a portrait I had started eons ago. Actually, I started all over again on it. I had begun on BFK Rives paper, which I had used for "The Power of a Praying Child" and it turned out okay, although I wasn't thrilled with the paper. I started the soldier on the Rives, and it just wasn't going well at all! It was depressing and slow going. I felt like I was fighting the paper. So, after much thought, I decided to start all over again on a different surface. This time it is on one of my all time favorites - Art Spectrum Colourfix sanded paper. Now, it is going much better!! 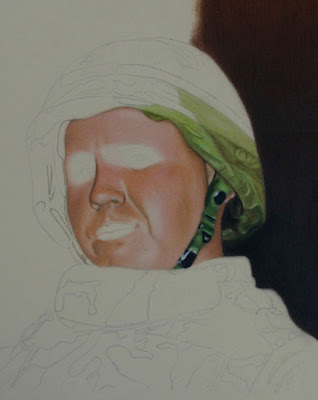 I have begun with his face and helmet, taking it one section at a time. I like working this way because I get satisfaction seeing the portrait really come alive day by day rather than waiting weeks or months to really feel like I was getting anywhere. I got depressed working on it before, I didn't want that to happen this time. His skin is a bit sun burnt from being out in the desert sun in Iraq. He is a 19 year old young man who died in Iraq last summer. It's heartbreaking, but this is a special request from his mother. I only hope I can do him justice and that they like the end result. I'll add an update as soon as I have made more progress. I suddenly realized that I hadn't posted any of my artwork here yet. How could I have been so remiss?! Well, I will just have to fix that then! 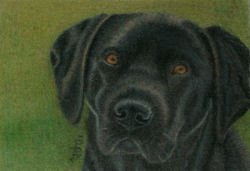 I am currently finishing up a small piece for a competition and a portrait just for fun. But, in the meantime, while I am working on those, I'm going to post my animal series on vellum film. These pieces are miniature works, all 2.5" x 3.5", and they are all on vellum drafting film. This type of film is archival and acid-free. It is textured and rather than being transparent, it is translucent, meaning that it is cloudy looking and not completely see through. This film uses up more pencils than you would imagine it too. So, if you use it, be sure to have your pencils stocked up. 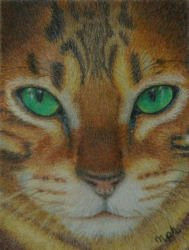 I used Derwent Coloursoft pencils with a few Prismacolors thrown in for good measure. Unfortunately, you cannot get very many layers on the film, even if you use a light hand. Therefore, you need to plan out how you want to mix your colors ahead of time and plan on getting the color mix you want within 3 -4 layers. If you use a very light hand, you might be able to get more layers on, but it's better to plan on only 3-4 layers; anymore than that is a bonus. In addition, because this is film and it is translucent you can work on the back of the film as well as the front. Not all films let you do this, it needs to be textured (matte) on both sides in order to do this. Many people who work on film use the back to do a grisaille or a complementary underpainting. A grisaille is generally done in grays. 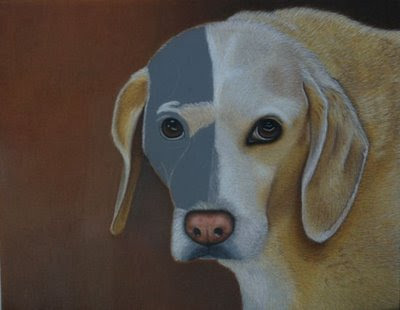 Both techniques are used to help establish the values of the painting before adding the final colors and to add a sense of depth in the painting. However, I did not use the back side on most of these mini's, though I probably should have. As you can see, I really enjoy creating macro shots of animals. I love doing the eyes most of all. To me that's the part that makes or breaks a painting. I hope you like these little miniature treats! All of them now belong to new homes all over the world. Good afternoon good people of blogville! I am the residing Queen of the Hoover household, Treat. 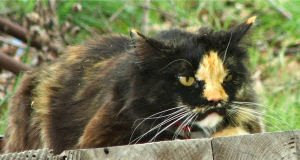 My human, Nancy, is still sick so I thought I would take it upon myself to introduce you to my loviness and give you some insight into the other, ahem, residents in the house. First is the most important one of all, ME. You can see all of my resplendent glory in the photo above. This is me watching over all of my kingdom, that is, before my human decided that I wasn't allowed outside at all except for the dreaded ........ oh I hate to say it ............. exercise. Argh!! Yes, she actually makes me exercise. Oh the inhumanity of it all - of course all the attention I get while exercising is worth it, plus the added benefit of getting the lowdown on who's been around visiting us and any little presents left for us makes it ...... almost ...... tolerable. But I ask you, look at that glorious body of mine!! Do I look like I need exercise?? Of course not! I'm just ............ poofy! It's all that beautiful fur, that's all. Anyway, I love to sit along the back of my human's chair when she sits at her drafting table drawing or working on her computer. She has this thing about me sitting ON the drafting table. Claims I'll hurt her artwork. Sheesh! When I'm not on the chair, I'm either following her around the house or forcing ... er ..... sweetly loving my way into her lap. If her lap is unavailable, I'll try another human's lap. At night, I lay cuddled with my human, preferably across her face - her breathing is so warm, soothing and relaxing. 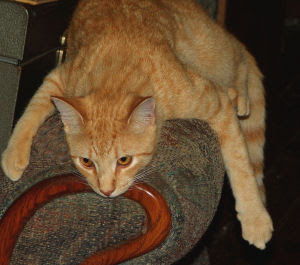 For some reason my human finds this position uncomfortable. Humans! Go figure! What? Oh, oh yes, I need to continue, don't I? The next resident I'll introduce you too to the goofiest, craziest, most ridiculous fool I have ever had the misfortune of meeting. His name is Tooki. You can see him in all of his foolishness right there on your right. Yep, he's a winner all right! I'm not quite sure why my human wanted him, but here he is. He was born here along with his brother, Blitz. Let me tell you, sharing a home with those two clowns was torture!! They were always tag teaming poor little me. 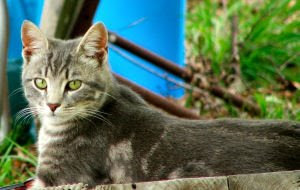 Well, Blitz is no more now (he got too brave with the mean outdoor critters), much to Tooki's dismay. Now Tooki and Tony (more about him in a moment) have turned my wonderful home into a race track! *sniff* It's awful! They whip around here, sliding around corners, bouncing off of everything from the top of the sofa, to the bookcase, right through the middle of my House master's (my human's mate) feet and under his desk ........ oooooooooooh, that's not good. Boy do they get in trouble for that! *snort* Hehe. What? Oh all right stop pouting. Tooki is insisting on me putting up a more flattering picture of him. So how's this one?? (hehehehehe). Oh be quiet! All right, all right, I'll put up another one! Sheesh, male cats. Sometimes there's no pleasing them. *smirk* I still like the one with Tooki's head in the watering can better. Hehehe, Hey! Back off there! No swatting the Queen! 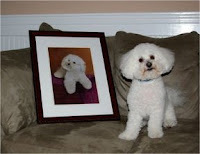 By the way, I had heard a nasty rumor that my human is painting a picture of Tooki for a competition. I actually saw it today. How insulting! Why she would ever want to paint such a nincompoop as Tooki I don't know, especially when she has such a glorious model like me around. Last year a new resident moved in. Why my humans felt the need to add to the number of felines in the house I do not know. 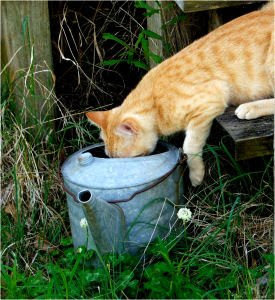 Humans often do fickle things for no reason. We have now got yet another male cat in the house. That's just not fair, two male cats against little ole me! Well, I had to make sure this new upstart understood his place here, and he was quite good about it all. Better than that furball Tooki is. Tooki will just never get it! Tony is of the long-haired variety, like me but not nearly as beautiful. You can see him below. 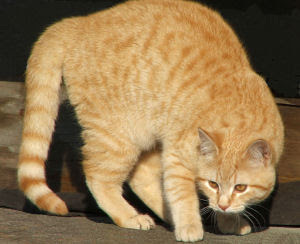 Whereas I have many splendid colors in my coat, he has only two, gold and white, just like Tooki. Can you say booooooooooring! He is quite mannerly though, and is even willing to play with me occasionally. However, he sometimes has the audacity of trying to play with me when I have not instigated it! I can not have that happening, so I put my paw down in no uncertain terms whenever that happens. Tony has been pretty good, even though he did not grow up here like the rest of us did. 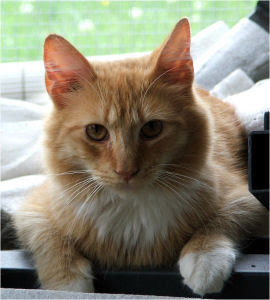 My human has raised all of us from kittenhood, but Tony came to us already grown up. He's the same age as Tooki (God have mercy on me! ), and I heard he lived in a garage before coming here. My humans have had a terrible time getting Tony to understand the concept of not getting directly under their feet and he has been stepped on several times. I think he's finally getting it though. Poor Tony doesn't understand, the only one here who can lay in the middle of a doorway in the middle of the night and not get stepped on is me! That's because I'm the queen (that, and I'm not stupid enough to just lie there and let myself be stepped on like he does). Tony doesn't try to steal my human's lap, or sleep with her (like some other buffoons), so he's okay. I won't post an embarrassing photo of him. *grin* Tony mostly likes to spend time in my human's brother's room. I go in there now and then to make sure everything is in order, but I let Tony have the run of that room. As long as he leaves my human and her son alone, it'll be all right. Now, there's one more resident feline here, she lives outdoors though. My human says we have to go live outside when we stop using the litterbox properly. The horror of it! I shall always be sure to park my tookus in the litterbox whenever I feel the need to go. My human is really serious about this! 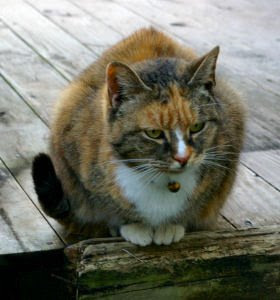 The outdoor feline's name is Mischief, and Mischief actually raised me to be the glorious Queen that I am today! She isn't my real mommy, but Mischief was already an adult feline living in my human's home when my human brought me home as a little baby. Mischief is about one year older than I am, but she is sooooo much more experienced from living outdoors with those possums, raccoons, bears, and other mean neighborhood felines!! *shiver* I don't think I could cope if I found my house taken over one night by one of those big ole nasty possums! But, Mischief likes living outside, although she does occasionally get lonely and my human brings her in for some loving when Mischief feels like that. Mischief has her own nice comfy house with a nice soft padded cushion for a bed and protection from all of the nasty weather we have here in northeastern NC! 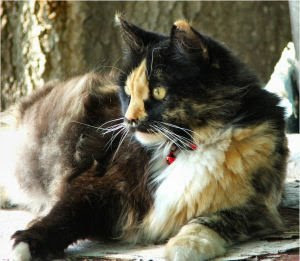 She's almost treated a bit too much like royalty for my taste, but I give Mischief some slack because she's outdoors. At least Mischief doesn't try to take over sleeping with my human like some felines do (Yes Tooki I mean you!!!! Just because I was sick myself while my human was sick doesn't mean you can take over comforting her). Hey folks! This is Tooki. Tony has her highness trapped and quivering like a kitten. We thought you should see what her highness is really like, so here's a photo of her overlooking her "kingdom" while plotting horrible things for me. Yes, it was ME she was looking at. *shiver* The Horror!!! ! Oh no, here she comes!! Run away, run away! The great behemoth queen is waddling after us!!! Ahhhhhhhh!! !